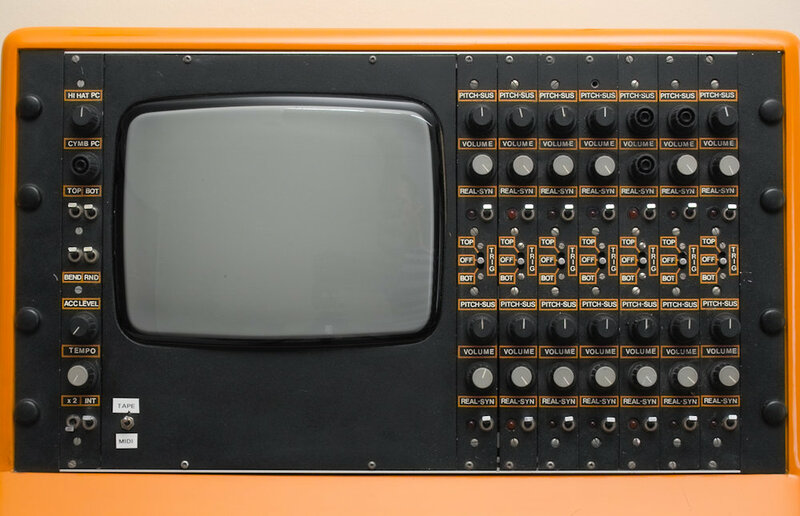 "This is a very rare British made drum machine from the early 1980's. According to wikipedia approximately 30 were made! Famous users included The Eurythmics (can be heard on Sweet Dreams, 1984), Phil Collins and The Thompson Twins. It is capable of both analogue synthesised sounds (Simmons style) and sampled drum sounds and has 14 voices in total (2 per card). Each voice can be switched individually between analogue and 8bit sample playback - quite an unusual feature. Patterns are created using the internal computer and chained together into a sequence much like any other drum machine. Overall physical condition is excellent, the casework is free from cracks and there are no missing knobs / keys. Of course, there are some signs of use which is to be expected. Most obvious are some scratches on the orange casework (can be seen in the photos) and a few missing knob caps. Functionally, there are a few issues which I shall list below. None I believe are serious. Voice 1 - doesn't switch between analogue/digital playback - digital always seems to be selected. Voice 5 - very very quiet. The CRT display is faulty and does not display an image. However, as you can see from the photos the internal computer is alive and well. I've demonstrated this by connecting an external monitor to the video out on the back panel. There are some crackly pots. I was unable to get the midi input to respond. Pattern 0 seems to crash the computer when fully erased - the others are fine. Other than the above it seems to be in good working order." The pictures were so beautiful i had to keep them. I'm glad i kept the text as well! It's so Beautiful! I'd love to make some beats on this!